"The cost of living in Addis Abeba was too high," Serkalem recalls, explaining why she moved to Legatafo. The notices were sent by the Legetafo Legedadi City Administration's Land Development & Management Agency that stated the land was needed for green space development, advised the residents to clear the properties themselves by a specific date and warned that the costs of clearing homes will be charged to the owners in cases of non-compliance. "We have even paid property taxes," says Anwar. "We didn't have a title deed for the land, but we had everything else, including a license for the clinic from the Oromia Health Bureau," says Yeshiarge Abraham (MD), owner of the clinic. "We were told that the land was needed for the expansion of a nearby school." This measure by the City Administration was taken following the city council's decision to implement a master plan, according to Habiba Siraj, mayor of Legetafo. "The houses are illegal and built inside a designated green area, buffer zones and areas reserved for social and investment purposes," Habiba told Fortune. "The demolition of houses built in violation of federal and regional laws are part of a larger operation," says Melkesa Midega (PhD), head of the Oromia Regional Government Rural Land Administration & Use Bureau, pointing out to the 12,000 settlements in Legetafo Legedadi without title deeds that are slated for demolition. But residents, as well as activists, claim that the city's measure to evict residents that have lived in the area for 15 years and paid property taxes is a politically motivated move more than anything else. They cite as evidence the selective bulldozing of houses in neighbourhoods, while the administration claims that such areas are needed for developments, is a telltale sign. The reason some of the houses were left standing is that the houses belong to farmers, which would require compensation before eviction, according to a statement by the Legetafo Legedadi Government Communication Affairs Office. Since the city has not accommodated a replacement for them, it has delayed their demolition, the Office's statement said. 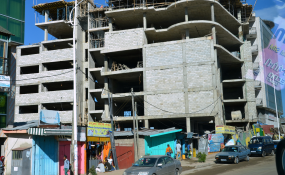 "Though the residents don't have a legal claim, they have a rightful claim arising out of de facto use of the land," says Yonas Tesfaye, legal expert and lecturer of law and development at Addis Abeba University. "This is not a normal case, and we shouldn't follow normal procedures, but rather principles of justice and equity should prevail," said Yonas. "The government's actions and omissions have contributed to claims of lack of moral and legal ground to evict these people." Human Rights Council, an independent human rights group in Ethiopia, has condemned the City's actions and has asked that compensation and resettlement of displaced people should be made. It stated that such measures will result in social and human rights problems. After placing her belongings and children in a neighbour's house, Serkalem managed to put up a makeshift plastic shed and stayed the first night in the rubble of her house. "I have nowhere to go," she says.